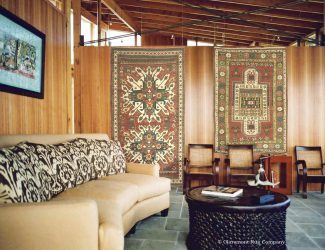 The prized Chelaberd design type is usually referred to by its established trade name, “Eagle Kazak” or sometimes “Sunburst Kazak”. In fact, the figure is commonly believed to stem from St. Joseph’s Cross – giving a clue to the Christian religion of the Armenians who make them. 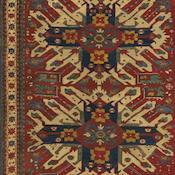 They are not woven in the Kazak region at all, but in Karabagh, directly to the southwest. 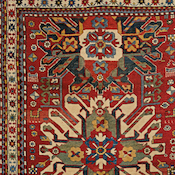 An excellent circa 1900 Caucasian Eagle Kazak rug in a Stately Traditional Interior. What is known in the West as “crab” garlands in the main border are traditional to Eagle Kazak rugs and other Karabagh rugs. They most likely were originally intended to represent sunbursts, stemming back to the Zoastrian religion traditional to this area. The majority of 19th-century Chelaberds feature two, three or two and one-half cruciform sunburst medallions, while “Single Eagles”, with one medallion, are sometimes seen. 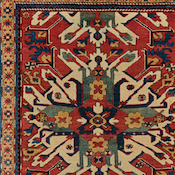 Eagle Kazak rugs often have small animal, bird and occasionally human figures woven into the field in whimsical juxtaposition to the grandeur of the cosmic major designs. Students of the symbology of the tribal peoples of the Near East believe this is meant to represent the macrocosm and microcosm, that planetary life is part of the universal order. 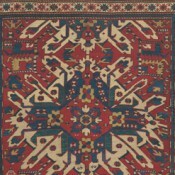 Most “Eagles Kazak rugs” on the market today were vastly inferior early 20th century rugs that were woven for export in the workshops Stalin set up in the 1920’s. In contrast, the best 19th-century examples are wonderfully idiosyncratic, with marvelous intentional inconsistencies and radiant colors, including prized rich teals and greens. Most of the collectible examples were woven at the turn of the 20th century or late 19th century, while representatives from the 1870s and the first half of the 19th century are occasionally found. These early Chelaberds are quite prized when they are particularly artful and in very good condition.